Indio, CA: Take a step back in time! Come and experience the Heritage Festival on Saturday, March 18th, from 10:00AM until 4:00PM on the grounds of the Coachella Valley History Museum in Old Town Indio. 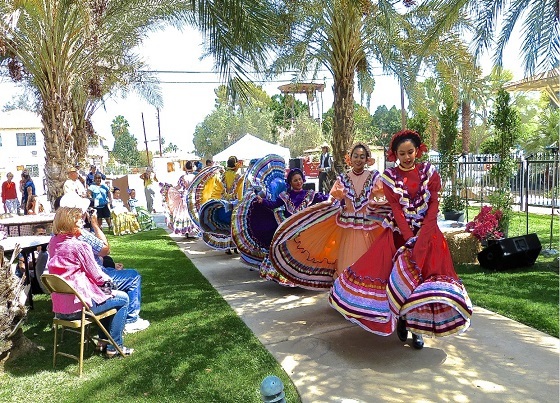 The Festival provides a unique opportunity to learn about the significant cultures that led to the settlement of the Coachella Valley all in one place. The Festival showcases the personal histories of Cahuilla, Mexican-American, Anglo, Black, Japanese and Armenian families by means of “story boards “ that detail their timelines and presence in the Valley. In addition, foods and entertainment representing these cultures are featured throughout the day- folkloric dancers, a Gospel Choir, fiddlers, storytellers, Barnaby Finch’s Jazzgrass band from Idyllwild and Japanese Taiko drummers, will highlight the event for 2017. Early American craft demonstrators will be on hand to share with our audience. Enjoy watching weavers and spinners ,wood carvers, potters , paper crafters, leather working and much, much more. Visitors can also take a jeep tour of the mural in old downtown Indio. Vintage Cars from the 20’s and 30’s will show in all of their splendor. Children can participate in old fashioned games and activities such as sack and egg races, jump rope, clothespin doll making, origami folding, ,Cahuilla crafts, dress-a-dolly, and Aunt Polly’s wash room. This family – oriented event is free to the community. The grounds of the Museum boasts many vintage exhibits and buildings. The center of the grounds has the 1927 Dr.Smiley-Tyler adobe home, surrounded by a complete blacksmith shop, farm equipment, the 1909 one-room Indio Public Schoolhouse and the Date Museum. The grounds also features a memorial Japanese garden, Dr.Carreon Desert garden, memorial rose garden, a working date garden and a Cahuilla ethnobotanical garden. For more information visit our website at : cvhm.org or 760 342-6651. You may also contact Maureen Boren, Chairman of the Festival at 760 221-0239 . Hours of the Museum are Thursday-Saturday, 10-4, Sunday, 1-4. The Museum is open from Oct-end of May. 82-616 Miles Ave., Indio,Calif.